No longer in production, these cards were handmade in small quantities with usually only a few hundred of each image being produced. Real photographs taken directly from the original artwork, mounted on 7" x 5" white card folding open to a blank inside, with good quality envelopes all individually wrapped in clear wallets. The few cards we still have available cost £2.50 each plus p&p, use our secure online shop to calculate total costs and place your order. Peter Barnfield set up his own graphic design studio in 1986. 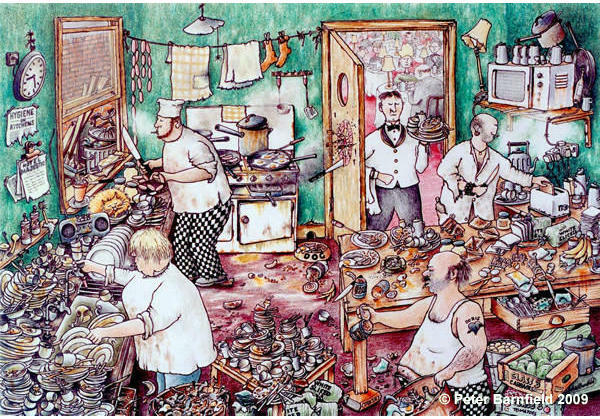 Finding a ready market for a growing range of his own illustrations, pictorial maps and humorous pictures, design and advertising were soon abandoned as he concentrated on producing original artwork. In 1996 his wife Ginny joined him to create, produce and market an expanding range that had by then become known as the Steam Pencil range of cards and prints. 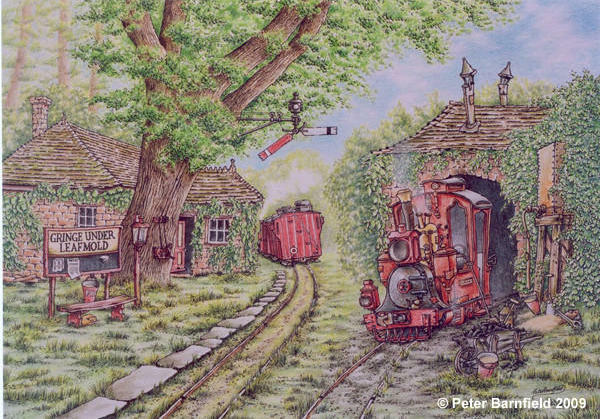 Whimshire has always been an important part of Peter's work, a mythical county the depiction of whose railways and people have long been a source of inspiration for him. In fact the Steam Pencil range is now largely devoted to illustrating with gentle humour the historic heyday of its bucolic transport system, industries and of course the people who once worked and travelled there, scenes which are far removed from the hustle and hubris of modern life. Peter freely admits to being an admirer of the work of W Heath Robinson and Roland Emett and it is quite possible that without their pioneering work we might never have been privileged to have seen Whimshire. Whilst you can see their influence in Peter's work he has clearly established his own unique style and taken his audience into territories previously uncharted by these illustrious artistic forebears. A highly accomplished photographer, Peter thankfully took the trouble to travel widely back in the 1960s to experience and record the changing railway scene. This has resulted in his work, both written and photographic, appearing in a number of published works and articles over the years. 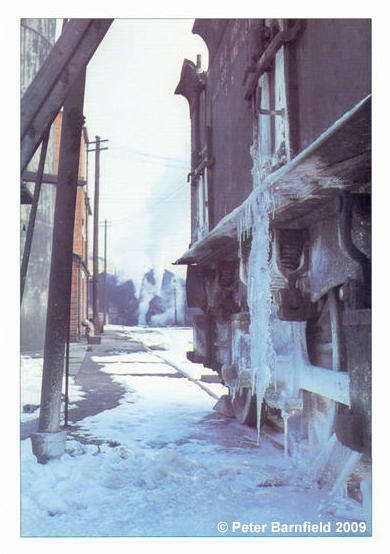 An example of one of Peter's more artistic photographs can be seen here, a highly individualistic and striking image of the steam railway in the depths of winter. The subjects that Peter chooses to depict, whilst being whimsical and even at times fantastic, all seem to me to possess an underlying truth born from acute observation. You may find this revealed in the Portersfoote Bunting's intricacies of timetabling, its characteristic architectural detailing, its infuriating operating practices or perhaps the irascible characters who populate its platforms. The chances are that all of these things and characters have either happened or existed sometime or somewhere on the old steam railways of Britain. This truth, born out of a deep and profound understanding and feeling for the steam railway and the people and places that it served, coupled with his superb artistry and technical skill, to my mind make Peter Barnfield one of the most pre-eminent recorders of the railway age alive today.